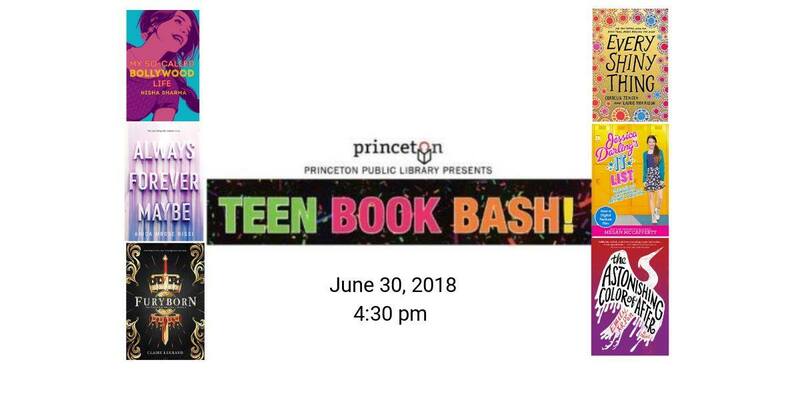 Join me for Princeton Public Library’s TEEN BOOK BASH, where I’ll be moderating a panel of six incredible authors (Claire Legrand, Emily X.R. Pan, Anica Mrose Rissi, Nisha Sharma, Cordelia Jensen and Laurie Morrison). If you like listening to authors talk about books, this is definitely your jam. This is a great line-up. It’s official. THE MALL. 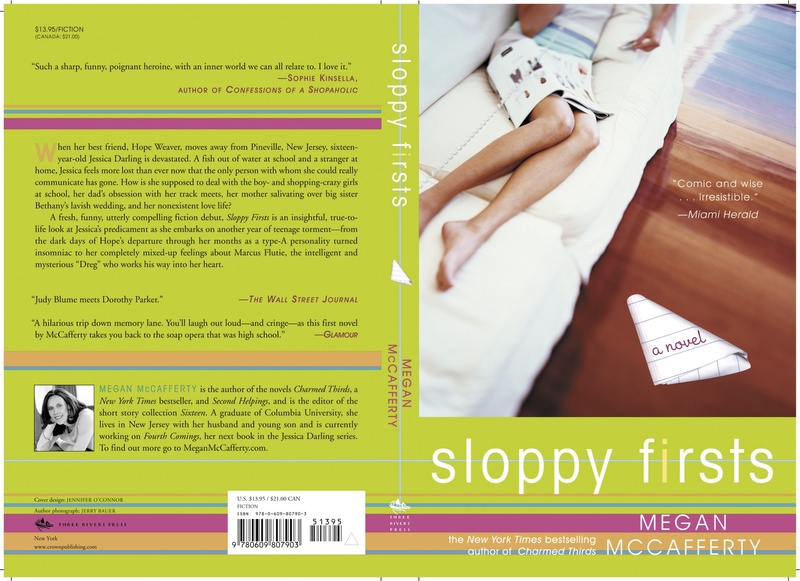 Coming Spring/Summer 2020 from Wednesday Books. Victoria Keith as Jessica Darling. What an opening night! 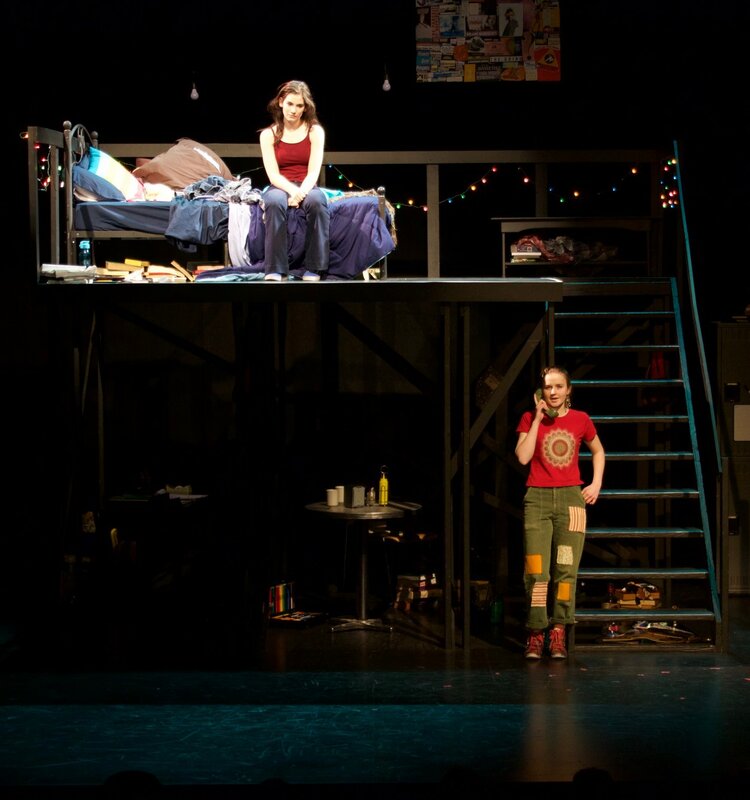 Congratulations to the phenomenally talented Round House Theater Teen Performance Company. I couldn’t be happier that this premiere was entirely produced and performed by high school students. 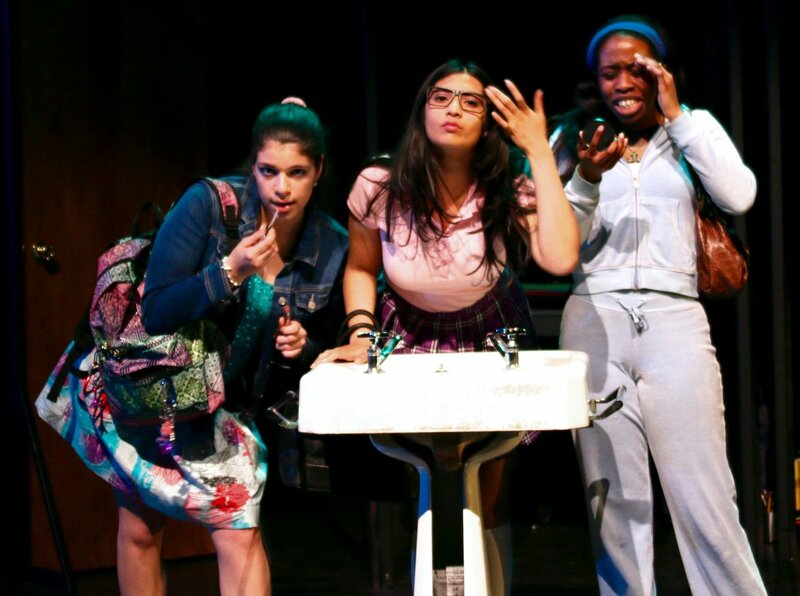 Emily Gordon as Bridget, Malaika Bhayana as Manda and Biloy Ambahe as Sara. Victoria Keith as Jessica Darling and Abigail Cannon as Hope. The cast and crew vividly captured all the humor and heartache of Pineville High School. 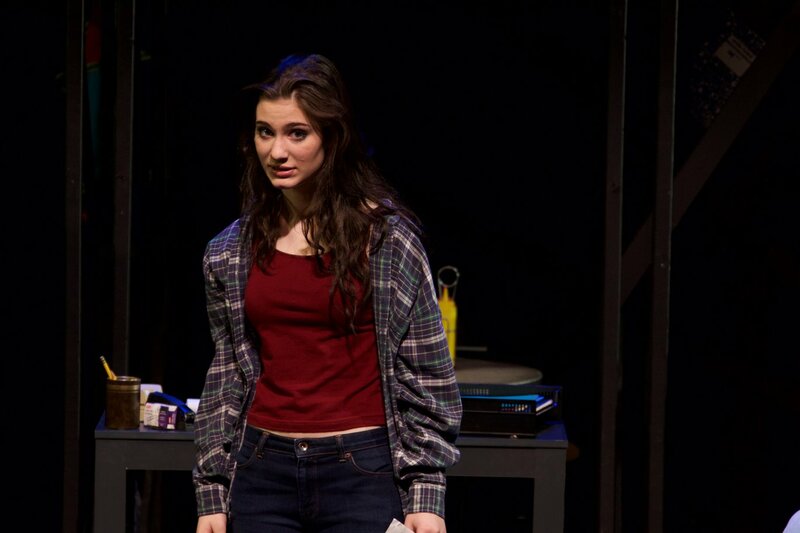 A special shout-out to Victoria Keith and Cole Greenberg whose nuanced performances stayed true to Jessica Darling and Marcus Flutie we know and love while still making the characters their own. 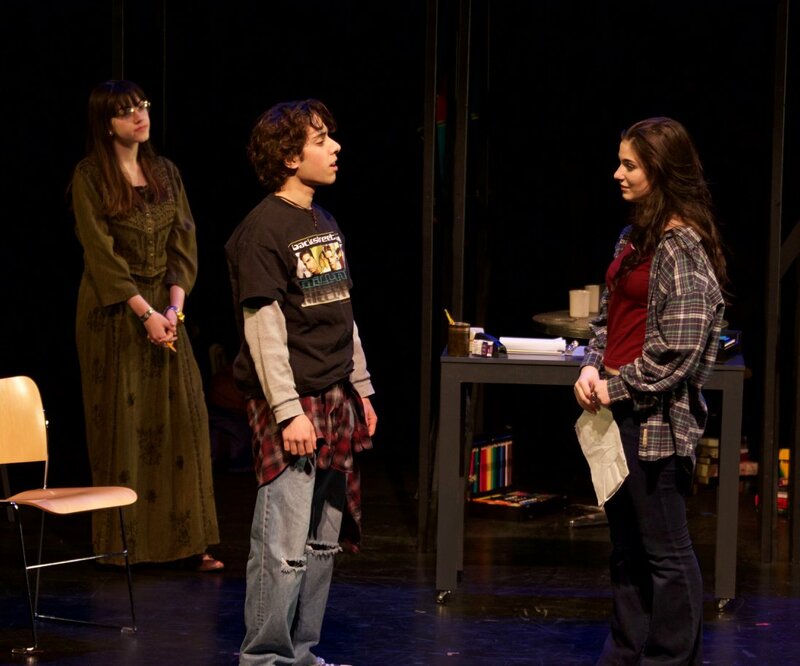 Keira DiGaetano as Haviland, Cole Greenberg as Marcus Flutie and Victoria Keith as Jessica Darling. This was an unforgettable world premiere that I hope is the first of many productions to come. 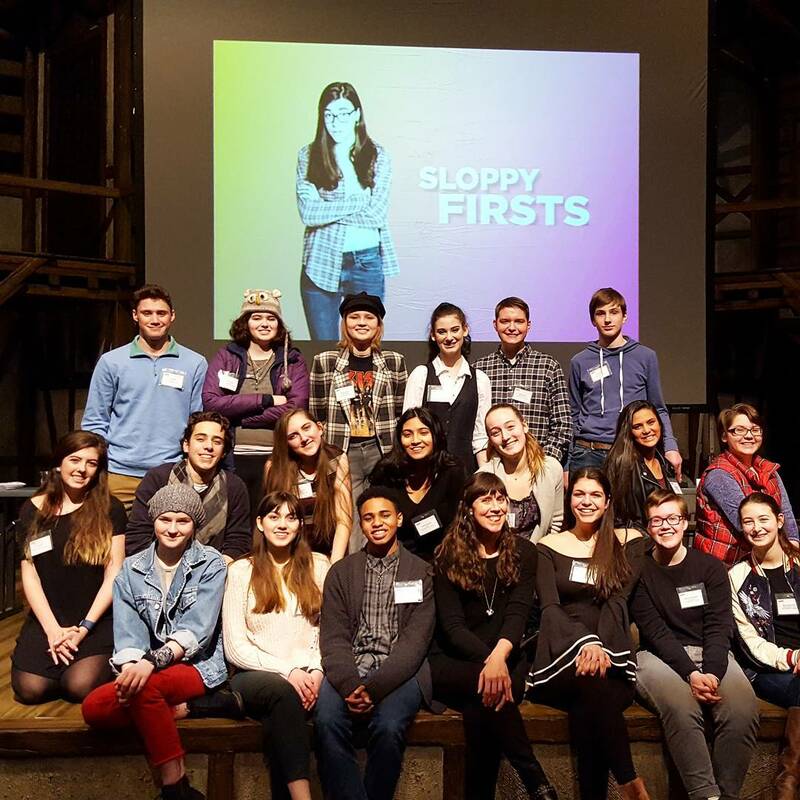 If you’re involved in a teen theater program and are interested in bringing SLOPPY FIRSTS to your stage, please contact me via megan@meganmccafferty.com. I spent my entire childhood and adolescence involved in local theater, so my young and dramatic self is SO JEALOUS. 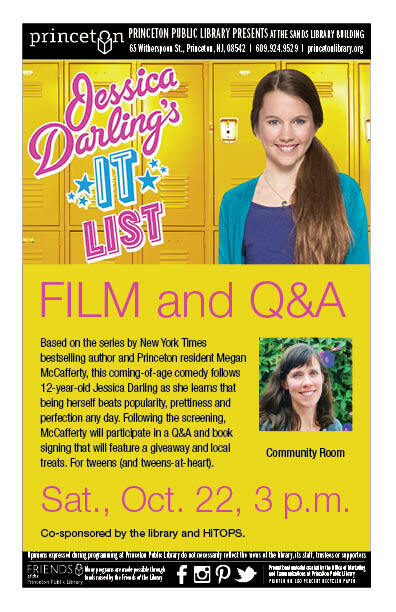 My grown up self is beyond thrilled for this creative, collaborative opportunity to bring life to Jessica Darling, Marcus Flutie and the world of Pineville High in a whole new way. Tickets are available RIGHT NOW. I’ll be at every performance. For sure. Thank you Barnes & Noble Teen Blog for this lovely tribute. I am celebrating the occasion by working on my first YA novel in five years. This is my third year volunteering for the NJ Trans Youth Forum sponsored by HiTOPS and GLSEN Central NJ. It’s the only conference in the state for trans-spectrum youth, allies and educators and I couldn’t be more thrilled to have been a part of it from the very beginning. This year I’m beyond excited to announce an #ownvoices author panel featuring Tyler Ford (MTV contributor), Alex Gino (GEORGE), Meredith Russo (IF I WAS YOUR GIRL) and Pat Schmatz (LIZARD RADIO), moderated by youth librarian and reviewer Kyle Lukoff. This event is run on a microbudget, so please consider making a donation to sponsor trans youth who will otherwise be unable to attend. 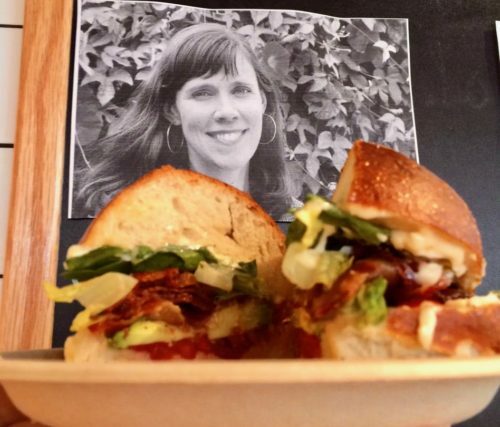 I’m honored to follow Albert Einstein, Cornel West and Trey Anastasio as LiLLiPiES Bakery’s Princetonian Sandwich of the Month. Like, seriously honored because I seriously love sandwiches. When asked what I wanted my namesake sandwich to be, I answered without hesitation. It’s as if I’d been waiting my whole life to shout: OMG BLT WITH AVOCADO ON PRETZEL BREAD!!! The sandwich is on sale through February and 10 percent of the proceeds will be donated to HiTOPS Adolescent Health Education and Advocacy Center in Princeton, NJ. This sandwich is a window into my very soul. I love to sing even more than I love sandwiches. 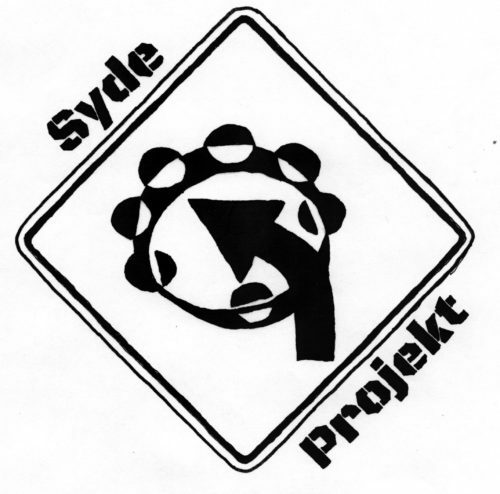 So to celebrate the best thing that’s happened to me in 2017 (by far), I’m performing two short acoustic sets with my band’s other band–the aptly named Syde Projekt–at LiLLiPIES Bakery in the Princeton Shopping Center on Sunday, February 26th between 1-3PM. Like Davy Jones before me, I play tambourine and sing. We are a covers-only band and do not take ourselves too seriously. Please come, listen and and stuff your face to support a fantastic organization. Books! So many LGBTQ books! Thanks to the generosity of *authors, editors, agents and publishers, we received nearly 300 LGBTQ books for the HiTOPS/GLSEN NJGSA Forum. 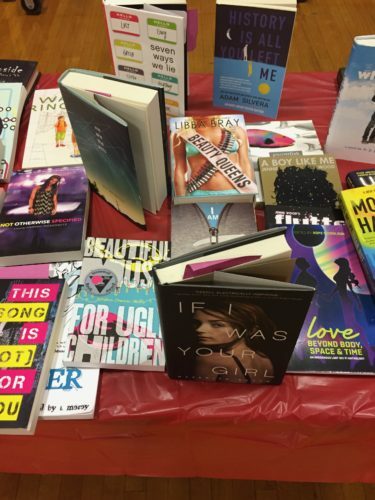 Here’s an overview of how these books were given to queer youth in need. 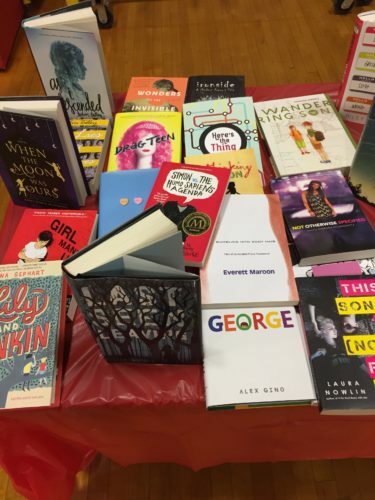 Roughly 100 books were added to the HiTOPS Adolescent Health Education Center’s LGBTQ Lit Library. This permanent collection will be available for all young people who take advantage of programming at the drop-in community center in Princeton, New Jersey. HiTOPS hosts weekly LGBTQ support groups that draw youth from all over New Jersey and Pennsylvania. Many aren’t out to their family and peers, which makes it challenging for them to buy or check out LGBTQ books from their school or public libraries. HiTOPS provides a safe space for them to enjoy stories that speak to them. All NJ GSA Forum attendees got a free raffle ticket and 50 books went out as prizes for superexcited winners of the drawings. Approximately 75 books were surprise takeaways for the youth, allies and educators who attended my LGBTQ Lit Story Time workshop. 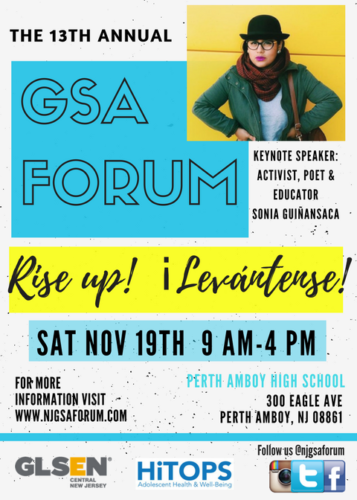 Another 25 were a special thank you for the passionate, hard-working members of the Perth Amboy High School GSA who volunteered many hours in preparing to host the forum. 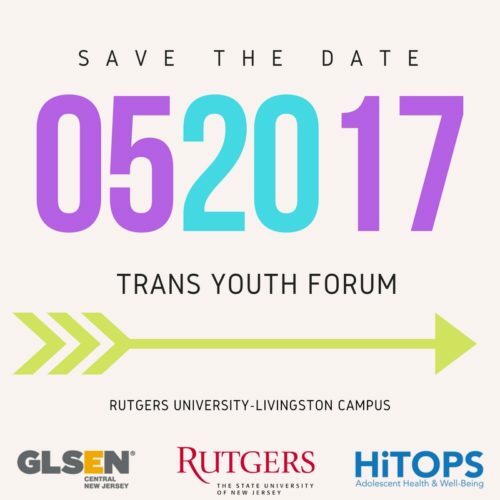 The remaining books were set aside for future forums, including the 3rd Annual NJ Trans Youth Form to be held in early Spring 2017. The election was a heartbreaking blow to the LGBTQ community. A shadow loomed over the room on Saturday, a palpable heaviness that I hadn’t felt in past forums. These kids are scared about the impact the incoming administration will have on their rights to live and love like everyone else. And yet, I was also a witness to such beautiful optimism. 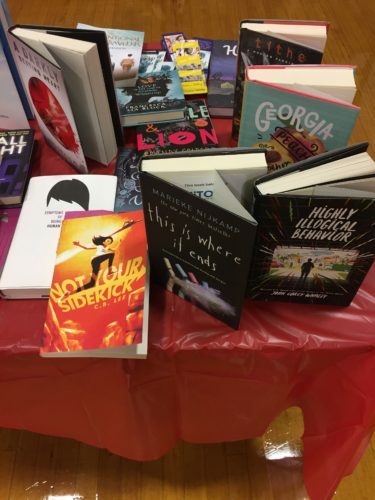 I lost count of the number of teens who rushed over to my table, brightening at the sight of LGBTQ books on display. They gushed about their favorites, snapped pics for their TBR lists, made confessions about the “secret” novels they’re already writing. When my story hour was over, many told me it was the highlight of the forum. I know they could have spent the whole day losing and finding themselves in new words and worlds. I’m a writer because I’m a reader. Books have always helped me better understand myself and others. I truly believe LGBTQ literature can change—and save—lives. Thank to everyone out there trying to make a positive difference in the world. Your work matters now more than ever before, so please keep doing what you do. *Thank you: Dahlia Adler, Jessica Anderson (MacMillan), Becky Abertalli, Meredith Barnes (Soho Press), Jaye Robin Brown, Rachel Cohn, Danielle Dreger, Kate Evangelista, Jeff Garvin, Donna Gephart, Brittani Hilles (St. Martin’s Press), Shaun David Hutchinson, C.B. Lee, David Levithan (Scholastic), E. Lockhart, Carolyn Mackler, Ann-Marie McLemore, Alison McDonald (The Rights Factory), Patricia Ready (Barry Goldblatt Literary), Caleb Roehrig, Riley Redgate, Meredith Russo, Kristin Seim (Candlewick), Robin Talley, Lindsay Smith, John Corey Whaley and if there’s anyone I accidentally omitted PLEASE LET ME KNOW.